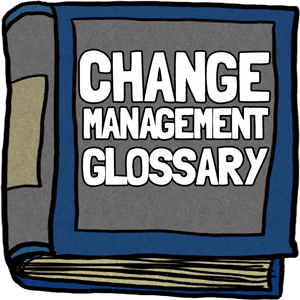 Use our dictionary of change management terms & definitions to ensure your organizational transformation efforts are clearly communicated. This is the current situation in the organization, i.e. the pre-change people, processes, technology, structure, strategy, culture, etc. Assister and resister analysis involves studying who is in favour of a change initiative and who is resisting it with a view to harnessing the Assisters and either minimising the impact or altering the opinions of resisters. The level of performance which is used for comparison after the change. This may just be past performance, but where other changes are going on this needs to be adjusted to take account of their impact. A measurable improvement, resulting from change, which is considered advantageous by at least one stakeholder, and contributes to the overall organizational objectives. Also known as a dependency network, a diagram showing the benefits, dis-benefits, objectives, outcomes, products and work and the connections between them. What does success look like for me/us? What gets me/us out of bed in the morning? What do I/we want to be remembered for? Being the opposite of the burning platform approach, the aim of the burning ambition approach is to reduce the anxiety about trying something new rather than increasing survival anxiety." The burning platform is a is a concept made famous by the “burning platform” memo written by the CEO of Nokia in February 2011 through which he intended to motivate his staff to help turn around Nokia’s fortunes. In one way, it is a good example of storytelling. It comes from the true story of a worker on the Piper Alpha oil rig when it exploded in July 1988, killing 167 people. An oil worker is woken in the middle of the night by an explosion on the oil rig. Despite the risks of falling from a great height, being eaten by sharks or dying of hypothermia, your worker decides “better probable death than certain death”. The change curve is a way of understanding and visually representing the level of an individual's confidence, morale and roll competence through a period of change. From its starting level, for most people it rises slightly, dips, rises again and levels out. Effective change management involves ensuring that the dip is as shallow and narrow as possible and that the curb levels out higher than it started. Change fatigue is neither an acceptance nor rejection of change, but is the state of being overwhelmed and exhausted by the amount of change going on and unable to absorb any more. An organized, concerted effort to alter part of or all of an organization. Change management is an approach to moving organizations and their stakeholders, in an organized manner, from their current state to a desired future state. Effective change management tries to do so in a manner which causes the least anxiety and resistance and therefore is the most likely to succeed. A system or approach which guides change implementers in performing a change. Change readiness is the capacity for change of a stakeholder of a change initiative. Coaching and mentoring tend to be used interchangeably, although there are subtle differences. Both involve helping the subject, for example through questioning, challenging or educating them. Mentoring tends to primarily relate to identifying and nurturing their potential to improve their prospects or position, whereas coaching is usually focused more on a particular circumstance or issue and is often more educative. Mentors often use their own personal networks to assist the progression of their mentee, coaching can be less personal than this. Communication channels are the routes used to pass messages, such as social media, email, verbal presentations, reports, etc. The opposite of a benefit. Force field analysis involves listing the factors (forces) which are in favor of a particular action/change and those which are against. Each factor is then given a score and the total of those scores determine whether the analysis is favorable or not. Organizations which do you force field analysis need to decide what will be considered in order to allocate a score what the range of scores will be. This can therefore be quite subjective approach, despite its seeming use of statistics. A process of assessing the current (as-is) state and the future (to-be) state in order to assess how to make the transition from one state to another. Gap analysis is a technique that can help organizations understand where they are, where they want to go and what actions are needed in order to get there. It is the process of assessing the current, as-is state and the future, to-be state in order to assess how to make the transition from one state to another. Geert Hofstede’s 5 dimension model is a cultural dimensions theory which breaks down the characteristics of a culture into five factors: power distance, individualism vs collectivism, masculinity vs femininity, uncertainty avoidance and long term vs short term orientation. Power distance relates to hierarchy, with flat structures reducing the distance between the least and most powerful. Individualism vs collectivism relates to competition and an individualistic approach juxtaposed with a collective, cooperative, team-centric approach. Masculine traits are seen as task orientation, whereas feminine traits are people orientation. Uncertainty avoidance relates to the degree of tolerance of risk and the unknown - i.e. both the level of knowledge about a subject and the degree of certainty about an outcome. Long term vs short term orientation relates to which way in time an organisation focuses. Those with a long term orientation focus on the future, how to get there, how to manage along the way and the rewards at the end of it. Short term oriented organisations relate more to the past and present, looking for consistency with historical values, tradition and persisting social norms. Gestalt theory is the basis for a form of psychotherapy that emphasizes personal responsibility against a background of our present experience and the sum of our relationships. Gestalt psychology therefore focuses on patterns and the whole set of circumstances, rather than individual elements, seeing them all as interconnected. Continuous improvements made to the organization in an ongoing, adaptive manner. These are gradual changes to the current state. Incremental change does not usually challenge the existing culture of an organization. These are metrics which demonstrate the performance levels in the future state, once achieved. Examples would include post-change initiative profit levels or customer satisfaction. These are metrics which give an indication of the progress of the change initiative towards the future state performance levels. Examples would include the number of enquiries about a product due to be released or the occupancy levels of a building which, once empty, can be closed and sold. Organizations often have a coordinated and standard set of training requirements delivered through a learning program which makes available the necessary training for employees to carry out their current roles and, in some organizations, to develop further. Having a program allows for training effectiveness to be increased by coordinating and reinforcing and the impact of additional training requirements on the existing learning program needs to be considered. For this reason, training departments are often considered stakeholders, as well as members of the change team. The 7S are structure, strategy, systems, skills, style, staff and shared values. The framework postulates that these seven interdependent aspects of an organisation must be in alignment with each other in order to successfully implement change. Either they must be maintained and reinforced to maintain performance during a change or they are used to identify the parts of an organisation which need to change. For example, when thinking about launching a new service, the organisation's structure must be adapted to contain and support the new service, the organisation's strategy needs to be supported by the service, the company's systems such as IT or finance need to support and have incorporated in their business as usual functions the new service, those providing the service will need the skills, the leadership approach in the organisation needs to support the new service, the appropriate staff to provide the new service are needed and the service needs to contribute to the shared goals or values. A leader who is able to help resolve any conflicts between individuals or teams affected by changes. These are specific statistics which demonstrate the progress or success of the change. Individual lagging or leading indicators are metrics. Things in motion continue to move in the same direction unless some effort is exerted upon them. The key aim of the organization which the benefits contribute to and the dis-benefits detract from. For example, improving market share, expanding services, or minimizing risk. Organizational culture is the shared story of the individuals within it. It is the deeply ingrained social fabric of the organization that drives people’s behavior. It is made up of the values, belief systems, dominant leadership styles, collective unspoken assumptions, stories, myths, legends and rituals as well as its character and orientation. A change of state (from as-is to to-be, or a stage along the way). This may be as the results of a product being made available or a transformational change being completed. Examples include revised team structures, revised working practices, ability to access IT systems on the move, or a production line going operational. PESTLE analysis looks at the political, economic, social, technological, environmental and legal factors which affect an organisation. It is a way of ensuring that a situation has been thought of in a practical manner from all sides. It can be combined with some of the other diagnostic models, for example by using it as a checklist to ensure that each of the 7S's in the McKinsey framework have been fully considered. It is a more practical and less conceptual method of analysis. A highly process-oriented senior manager who is able to assist in the planning and implementation of change activities. The leader who authorizes and is responsible for the change initiative. Typically they lead the change management leadership team and provide the funds for the project. A tangible item which the organization requires in order to make a change and realize a benefit. Examples include IT systems, new teams, buildings, machinery or research results. Project management is the discipline which manages projects, through planning and organizing the resources, controlling the quality and is ensuring adherence to the time constraints. For example, they would ensure that the machine is delivered on time, at the right price and that it is being built to the specifications and quality level required by the organization to bring about the desired benefits. A manager who exerts authority by funding only projects and initiatives that are in-line with the change initiative’s goal. Measures which indicate a level of performance but which cannot be given a specific value. For example, customer satisfaction can be measured through satisfaction scores, but the degree of value of the increase in these scores cannot be quantified. Measures which indicate a level of performance and where the increase or decrease in these measures can be valued. For example, staff turnover is a measure whose variation can be given a fixed value (n.b., value does not have to be financial). Return on investment is a specific quantitative measure, the ratio between the amount of money spent on achieving the change (known as cost of change) and the financial value of the improvement (the return). The return needs to take into account both the positive value of any improvements (known as benefits) and the negative value of any disadvantageous results of the change (known as dis-benefits). Using this method requires organizations to attempt to put a financial value on benefits which may not be financial, such as improved staff morale, customer satisfaction or increase reputation, hence the move in many organizations towards a portfolio of financial and non-financial measures which give a rich picture of the value of the change. A leader with the undesirable trait of assuming that merely making a presentation on the need to change constitutes sufficient personal involvement in the change effort. A senior leader inside an organization who supports the change management leadership team. A person or group which has an interest in the process or result of a change initiative. They do not necessarily have to be directly or indirectly affected by a change initiative to be a stakeholder; some stakeholders are unaffected but can wield direct or indirect influence, such as damaging an organization’s reputation or encouraging public support. Examples of stakeholder groups include: customers, groups of employees, people with specific roles within the organization, the media, government, society, competitors, trades unions, campaign groups, etc. Stakeholder analysis is about identifying who has an interest in or influence over a change initiative and what their characteristics are. What barriers or potential sources of resistance could prevent the individual or group moving towards the change? If the stakeholder is a group, what differences would the change make to the roles, processes and structures in that group? Stakeholder mapping involves representing stakeholders on a grid that displays their level of power (or influence) on one axis from low to high, and their likely attitude toward the change on the other from positive to negative . Strengths, weaknesses, opportunities and threats analysis is used to analyse what is not ideal about the current state, what about it should be capitalised upon or exploited and what risks or threats there are as a result of the current state which could be reduced. It is then repeated on the suggested future state both to analyse how well it has capitalised on the strengths, dealt with the weaknesses, exploited the opportunities and minimised the threats and what's the strengths, weaknesses, opportunities and threats are of the new state. this is the desired future situation in the organization, i.e. the pre-change people, processes, technology, structure, strategy, culture, etc. Training needs analysis is the process of identifying the knowledge and skills gaps of individuals, teams, functional units or organizations in order to develop a learning program to address those gaps. Training needs analyses often form the basis of long-term, business as usual learning programs, ensuring that the training remains relevant and aligned with organizational need. For this reason, the impact of the change initiative's TNA on the organization's ongoing learning program needs to be considered. Change which is not merely an extension of, improvement or modification of the current state of an organization, but one which involves a complete and fundamental change to the organization, involving changes to processes and systems, people, structure and/or culture. A senior leader with sufficient authority whose intervention may be sought in removing difficult organizational obstacles which hamper progress during the change. The VIRO framework is a scalable set of four questions which can be used to focus down onto an individual resource or capability or up to an entire organisational market. It is based on four questions asked about: Value, rarity, imitability and organisation. Value concerns the value of the item in question to the organisation - does it enable the organisation to achieve something new or reduce/avoid a threat or risk? Rarity relates to both availability and the right to exploit a resource such as with intellectual property. Imitability relates to how difficult it is for other competitors to enter the market. The more difficult it is for somebody else to imitate what the organisation is doing the higher the barriers to entry into the market. The final question, organisation, asks whether the organisation is ready, has the capacity, willingness, etc. to make use of the resource or capability. It may be that one would use one of the other frameworks to ensure that all aspects of the organisation question are covered. This framework differs from some of the others as much of the focus is on external factors and actors. The change vision statement is a pithy, inspiring description changed organization will look like. It should be short, punchy, easily understood, appeal to all communication styles and be memorable. If leaders cannot easily, quickly and convincingly encapsulated a change, it is unlikely they will persuade others to buy into it. The vision should be what the organization returns to when confusion develops about the change and what it uses to enthuse stakeholders to support the change. A sponsor who inspires others within the organization with his or her vision of a desirable common future.